Here at Who Dares we’re thrilled that Stuart Manning has agreed to come aboard and bring with him a selection of stunning poster designs inspired by the Capaldi Doctor Who era. 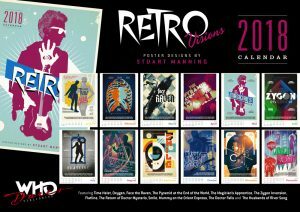 These make up the Retro Visions Calendar 2018 available to pre-order now! Stuart’s well known in both BBC and Doctor Who circuits and he also has a superb book out on Worzel Gummidge published by our friends at MIWK. We’ll leave Stuart to explain all in his own words especially written for us. Of course, things didn’t quite work out that way. I tried painting my own poor imitations of various covers, vainly trying to master portraiture in gouache and acrylics, but by the time I might have been getting somewhere, digital design was on the rise and those skills seemed redundant. It was only many years later, on a whim, that I had the idea of combining Doctor Who with my love of retro design, and something seemed to connect. I love the the tactile quality of past design – the sense of immediacy, dynamism and gusto that seems to embody that world of cow gum, scalpels and foxed edges. I also admire the lack of pretension in graphic design of the past – work that has no more ambition than to sell an idea with clarity and excitement. So, when Peter Capaldi’s Doctor arrived, I began regularly creating posters for the episodes with all this in mind. I treated the pieces as little experiments, playing around with visuals I’d enjoyed elsewhere, incorporating details or wrinkles that amused me. It wasn’t an intellectual approach – far from it – but just hunting around for influences or styles that ‘clicked’ with a title or an idea. That might be as obvious as pairing an emoji robot with 1980s Japanese video game graphics, or a mummy story with Deco Universal horror credit sequences, or sometimes just something plain contrary – like a Christmas episode rendered in the paper-cut world of Rankin-Bass animations or Paddington Bear. Having worked in magazines, I was keen to create images which used typography as an integral part of the design, rather than something just added on afterwards. Combining that approach with influences beyond the world of Doctor Who wasn’t a conscious creative direction, but that’s the groove the designs settled into. Retro Visions draws from three seasons of designs and is my little visual love letter to Doctor Who. I hope people will enjoy seeing the Doctor’s world reflected through different prisms and the glow of more innocent times.